It's a busy day and a busy week here, so: here's a glance at one of the nations that shares a border with Druthal. I still need to re-work my various "national documents" to a format that suits me, so this is still somewhat provisional. Of course, this sort of worldbuilding writing is usually only personal and provisional; you'll not see another book that starts with "Concerning Hobbits". But I'll share. This is just the tip of the iceberg, of course. If you want to know more, let's have a little Ask Me Anything About Waisholm. Challenge me. The government of Waisholm is a monarchy, however in the Waish system the king, despite being called the Chief of the Clans, is not truly above the rest. Each of the clans are led by the Clan Lord (who is sometimes given the Druth/Kieran title of Duke), and the King of Waisholm (who is also a Clan Lord) is considered first of his peers. However, at the Clan Council (as this group of Clan Lords is called), ancient tradition gives control of the proceedings to the Clan Lords of the Strongtree, Ironroot and Kinslayer clans. Therefore, if the king is not the Clan Lord of one of these clans (which is often the case), he starts out as an inherently weak king. Thus, Waisholm has a decentralized, clan-based rule. Within each clan are a number of septs, and the leader of each sept (given the title of Thane) pledges fealty to his Clan Lord. The general Waish character includes immense pride in one's group. When interacting with someone from another sept, one will be fiercely loyal in defending his sept. With another clan, they will defend their clan, and against other nations, they will defend Waisholm. There is an almost tangible sense that all the clans are together and united against the rest of the world. They view each other as an extended family, and fights within the family are acceptable, but if someone from outside the family starts a fight with one, he will have to fight them all. A traditional story is told in which a Druth traveler enters an alehouse in Strongtree country, where the patrons were all exchanging insults about the Ironroots. When the man joined in with the insults, however, the Strongtrees all proceeded to physically eject him from the establishment. Most law in Waisholm is a combination of new concepts handed down from the Kierans and the Druth mixed with traditional Old Waish Clan Laws. It reads similar to the Druth Rights of Man, with some additions. These additional laws primarily concern two things: respect to the sept and clan, and ensuring personal freedoms. One freedom that is strangely unique to Waisholm is the Right to Quarrel, which gives one the freedom to start a brawl (in other words, a non-lethal fight), if one feels they have been sufficiently provoked. This law is put in tandem with the Right of Provocation, which gives one the right to say or do something that would provoke another to fight, since you choose and accept the consequences thereof. 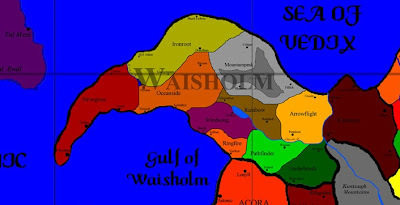 Any crime done in Waisholm will usually cause one to be imprisoned for five to fifty days. The length of this imprisonment is at the discretion of the Thane in whose territory the crime occurred. The Thane usually appoints a Sentencer, whose job it is to lay out punishments, so the Thane does not have to deal with it directly. Each Thane, and through them, each Clan Lord, is responsible for assembling the men under them into a fighting force. This mostly takes the form of a rough militia in which the Thane is General. Other men of noble birth take the role of officers in the militia.